Like it happens in the Spanish television program “Callejeros Viajeros” (travellers on the road) , which shows an alternative vision of cities and countries, when our colleagues travel to other countries we ask them to give us a portrait of the society and culture that they explore and their personal experiences. This is our particular Business traveler’s guide, through which we establish contacts with the local industry and enjoy its people. At E & M Combustion we are passionate about providing the best service and taking care of our customers around the world, to which we propose Combustion Solutions for oil and gas sector, power generation, food and beverage industry and other industries. This time we have travelled to India and Indonesia, flying over the Himalayas. 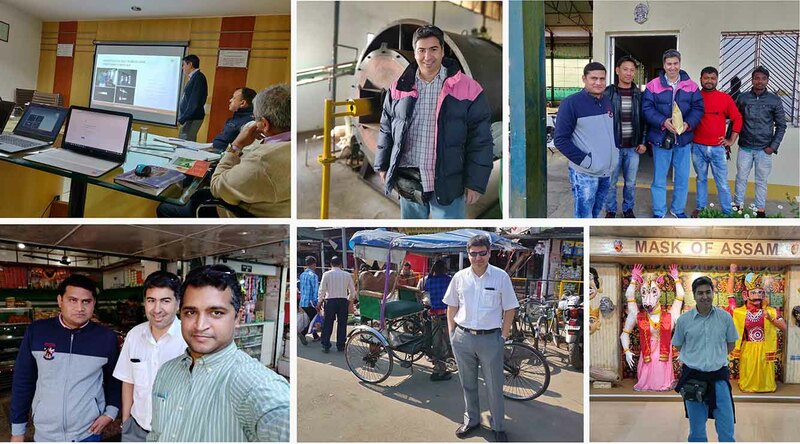 We taste the delights of their gastronomy and meet the men and women who work in the oil and gas industry in Dibrugarh, in the state of Assam, and in Surabaya. Dibrugarh, known as the Tea City of India, is one of the largest cities in the east of the country. It is the industrial hub of activities related to oil and natural gas, energy generation and the fertilizer industry, in addition to the production of tea. As exponents, Oil India Limited, the second largest company, focused on oil exploration and transportation, is based in Duliajan, 50 kilometers from Dibrugarh City. They also have their headquarters AGCL, the public gas company; BCPL, the cracker gas project or DNPL, the gas pipe joint venture. Among the energy efficiency measures initiated is the National Energy Master Plan (RIKEN), which stipulates a target for Indonesia to decrease its energy intensity by about of 1% per year on average. The plan identifies sectorial energy saving potenctial: 15% to 30% for the industry. Without this plan, energy use is projected to increase rapidly under a business-as-usual scenario by 41% in 2025. According to the World Bank, the National Energy Policy is aimed at achieving an optimal energy mix in 2015, in which less than 20% comes from oil, more than 30% of gas, more than 33% of coal, more than 5%. % of biofuel, more than 5% of geothermal energy and more than 5% of renewable energy. In Surabaya, our colleagues, besides working in a pleasant business environment, tasted a delicious meal of fresh fish and seafood chosen directly from the fish tanks.